Stout and potentially powerful, the Bulldog certainly lives up to its namesake. It's tough to find a company with more experience in PCs than Corsair. In the past 20 years it's touched nearly every component inside a PC and have made small, but profound changes to solid state drives and liquid cooling systems. But with the race to bring PC gaming into the living room at full Steam (see what I did there? ), Corsair has decided to bring its wealth of experience to the home theater PC, or HTPC, world. The Fremont, Calif. company's first product, called the Corsair Bulldog, is a skeleton kit designed to provide enthusiast builders the basic parts needed to construct a killer 4K rig the size of a gaming console for around $399 (about £260, AU$520). The kit includes a custom red and black angular chassis, a mini-ITX motherboard, a small form-factor liquid CPU cooling system and a 600W mini power supply unit. What that means, however, is that you'll need to supply your own graphics card, memory, storage solution and CPU that matches the socket of the motherboard. If that sounds like a lot to you, it is. But Corsair is encouraging potential buyers to scrap aging machines for parts or upgrade the Bulldog's internal components over time to reduce the upfront cost. The Bulldog, like its namesake, is squat, powerfully built and can pack in some serious muscle if you know what you're doing. 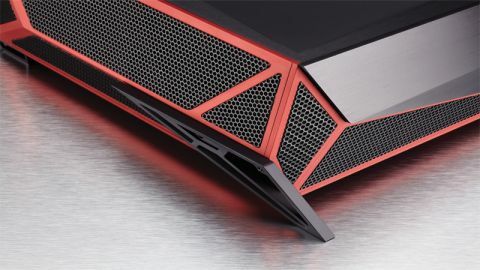 Its red and black custom chassis is larger than the Steam Machines that are destined to grace living rooms later this year, but even so it's far less conspicuous than a full-size desktop. It's a heck of a lot quieter too, thanks to the vents that encircle the case and the liquid cooling system that's running inside. Best of all, storage space will never an issue. You can easily fit one 3.5-inch HDD and one SSD or three SSDs inside the storage bay without running into any issues. But its whisper-quiet noise output, mini-ITX form factor and potential 4K capabilities don't come without compromise: the Bulldog isn't exactly petite. It's larger than any other game console or Steam Machine, and requires a relatively open space to push warm air into. And again, it's worth reiterating that the Bulldog isn't a complete system on its own – you'll need to supply your own CPU, RAM, GPU and storage. For its size, there's a lot of room inside the case to work. Airflow was a major focus for Corsair, and veteran builders will appreciate the added effect of having parts of the case easily accessible. The Bulldog's capability for mods is its secret weapon. Some Steam Machine systems come with preconfigured parts, so there's no way to upgrade them down the road. Bulldog is different in that, at any time, you can swap out an old component for a quick tune-up or drop in extra parts from a spare rig. In terms of performance, I saw the Bulldog steamroll its way through The Witcher 3 on almost all of its settings set to ultra, before deft-handedly taking on GTA5's grueling benchmark test in 4K. The latter had a bit of pop-in and some screen tearing, I noticed, but I chalked that up to the fact that G-Sync was turned off. Ultimately however, performance will come down to the parts you can spare or are willing to invest in. The upside of creating a massively powerful gaming rig in the living room is that it can easily process Ultra-HD video from Netflix or YouTube, once more content starts coming down the pipeline in the coming year or two. Bulldog isn't the only dog in Corsair's kennel. Similar to the Roccat Sova, Corsair's Lapdog is a lap desk that supports a ten-keyless keyboard and any USB mouse and connects via a 15-foot braided USB cable to the Bulldog. It's designed to be sturdy enough to withstand the force you exert by typing and moving the mouse without falling off your lap, but not overly burdensome that it feels like a 20-pound weight is on your legs. Corsair doesn't have an exact release date for the Lapdog, but is targeting a price of around $89 (about £60, AU$115). With Steam Machines in their staging area while Valve puts the finishing touches on SteamOS, Corsair's Bulldog is primed to steal a spot in gamers' living rooms. An intelligently designed chassis and even smarter cooling systems keep the Bulldog running quiet, while its miniature PSU has the capacity to fuel all but the hungriest of GPUs.